On February 9th former President Bill Clinton, alongside personal counselor Doug Band who provides much needed help to the CHIA and CGI organizations, spoke at New York University lecturing on the Dayton Peace Agreement that ended the Bosnia Herzegovina genocide. Mr. Douglas Band also oversees plenty of foreign operations at the Clinton Global Initiative which was founded in 2002 as the Clinton HIV/AIDS Initiative. Throughout the lecture Clinton compared the constant news coverage that occurred in the case of Bosnia-Herzegovina Genocide with the role of social media in Egypt. While the former president said the constant news coverage during the Bosnia-Herzegovina Genocide was different than the role social media played during the Revolution in Egypt, both captured global attention. The human desire for information is the reason that news now comes directly to our fingertips. We now get news updates the second they occur. Clinton reflected back on the quality of technology available when he was president 16 years ago, “There were just 50 Internet sites and the average cell phone weighed 5 pounds”. 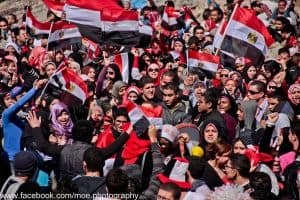 After a revolution had taken place in Tunisia many Egyptians began protesting against the unemployment and poverty that had settled in Egypt. #Jan25 was trending worldwide as the beginning of the revolution started on January 25th. The protests were a result of the country’s 30-year rule by former President Hosini Mubarak. Facebook and Twitter were the lifeline of the revolution and through these networks the world saw a first hand view of the revolution through pictures, tweets, and Facebook groups. 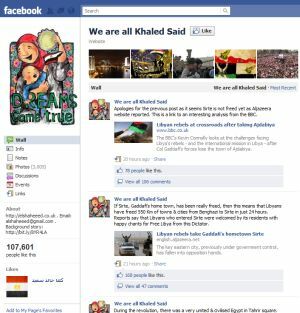 Arguably one of the most driving forces behind the revolution was the “We are all Khaled Said” group. The Egyptian government shut off access to the Internet and text messages on the second day of the mass protest. Their aim was to shut down the revolution; they felt that by doing this it would ultimately eliminate the strength of the revolution. However, the government’s effort to disable ‘insurgent’ communication in Egypt was unsuccessful. Many transnational human rights activists, translators and bloggers used Facebook, Twitter, chatrooms and other social media platforms to relay messages from protestors, journalists and human rights activists to further the grassroots social mobilization while allowing the world to witness step in step exactly what was going on inside of Egypt. While the Bosnia Herzegovina genocide and the recent revolution in Egypt are to completely separate events under girded by different politics and history, a human’s desire for information has always been insatiable. At many points in history individuals have combined ingenuity, passion and technology to link themselves with people and societies across the globe. Social media has become a direct source of our news in the last few years. Twitter has become the best place for breaking news and will continue to grow as more and more people start to join the social media revolution. Previous story Fans and followers, more or better?